Could It Be That a New Drive-Thru Starbucks in Newbury Park Coming in Early 2013? Update 1/18/13: The Newbury Park Drive Thru Starbucks opened today. Update 1/10/13: Starbucks employees indicated today that the drive-thru Starbucks across the parking lot will be opening on January 17th! Next to it is a Sprint store (there's also a Verizon store and AT&T store at The Village at Newbury Park. Update 12/19/12: Nice progress on the Newbury Park Drive-Thru Starbucks! Looks like things are moving right along. The drive through window on the left of the building looks might nice too. Update 10/5/12: Construction of the Newbury Park Starbucks Drive-Thru seems to be coming right alone. Here are some recent pics. That does look indeed like a drive-thru to me! Original Post 9/8/12: Several CVG readers have asked about what is being built at the corner of N. Wendy Drive and Grande Vista Drive (975 Broadbeck Drive) at The Village at Newbury Park in what had been a vacant lot in between Ranch Hand BBQ and Islands. 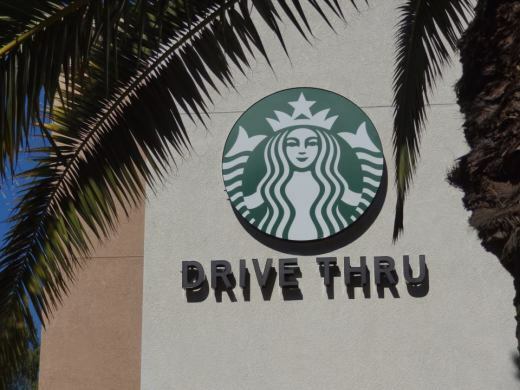 It has already been well publicized that a drive-thru Starbucks is coming to the northwest corner of Thousand Oaks Boulevard and Rancho Road in Thousand Oaks. Could it be possible that yet another one is coming to Newbury Park!? The City of Thousand Oaks Planning Department indicates that an approved commerical project under construction at 975 Broadbeck Drive is for a "retail building with drive thru adjacent to existing retail center." Rich Development of Orange County, notes on its website: "Jun 27th 2012 - New development breaking ground in Newbury Park featuring Starbucks and Sprint. Construction to be complete in the first quarter of 2013. Located off Wendy and Grande Vista. 4529 Sq. ft total"
The Hagelis Group markets lease space at The Village at Newbury Park. In addition to the spaces previously occupied by NextGen Gaming and Baja Fresh, they are currently offering 1,600 sq ft end cap unit that is currently occupied by STARBUCKS! And quite oddly, there is no mention of Starbucks mentioned in their brochure! So we stopped by Starbucks tonight and asked the staff. According to them, the answer is yes indeed! There will be a new Starbucks across the parking lot that will include a drive-thru! And they confirmed the anticipated opening date would be sometime early next year. Coffee on the go? You'll have it soon at 2 locations here in the Conejo Valley.